A superb, value-priced machine that gives you all the capability you need to make any specialty coffee drink you can imagine. It’s not without its limitations, but for the price, is a tremendous value for the money. Recommended for: Single power drinkers. Small households with 2-3 casual coffee drinkers. People new to the world of specialty coffee. Have you been seeking to replace your old drip brew machine, but don’t want to spend a fortune to experience coffee shop flavor in the comfort of your home? 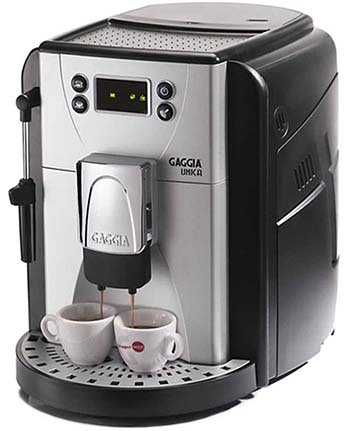 If you answered yes to either of those questions, then you’re going to love our in-depth Gaggia Unica coffee machine review. Being a value-priced entry, it is by no means a perfect machine, and in the sections below, we’ll take a close look at everything the Unica can and can’t do. By the time you reach the end of this review, we think you’ll agree, for the money, it represents a tremendous value for the right kind of user. Is that you? Let’s jump right in and find out! 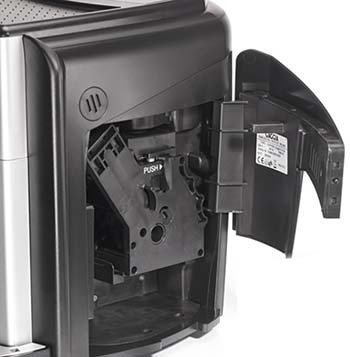 The first thing you’ll notice about the Gaggia Unica is that it comes up a little short where aesthetics are concerned. It wouldn’t be fair to say that it’s an outright ugly model, but it’s clear that its looks weren’t at the forefront of the design team’s mind as they built it. It’s a relatively modestly sized machine, measuring 12.6” x 18.14” x 14.64,” and weighing in at not quite 20 pounds (19.84). The reason behind its surprisingly light weight is that it is constructed entirely of ABS plastic. This is obviously not as sturdy or durable as stainless steel, so don’t expect the Unica to last you forever. Having said that, Gaggia offers the same two-year warranty that they offer on their more expensive machines, and with proper care, it will serve you well for far longer than this. Note that the Unica sits on a swivel base, so even if you put it in a corner someplace, you’ll be able to turn it to easily access the side panels, which is highly convenient. A lot of Gaggia Unica super automatic espresso machine reviews pay particular attention to its reservoir size, and ours will be no exception. For us, as power drinkers, it’s a huge deal, and ideally, we like to see a water tank of at least 60 ounces. Bigger is always better. We’ve never run across a machine and said: “Gee, we wish the water tank was a little smaller.” It’s just not something that’s likely to happen. The Unica features a 57-ounce, side loading water tank, which is a shade smaller than we’d like, but we count it as close enough, especially given the low cost of the machine. That’s one of the last things you want to do on a budget-priced model anyway, so you’ll either have to get used to periodic descaling, or use distilled water in your tank to minimize it. Or, use the filter, reduce your maintenance, and just live with the slightly diminished tank capacity if you like that option better! This is another super important part of our Gaggia Unica review, and on this front, it’s a bit of a mixed bag, with some aspects of the grinder we liked, and others we didn’t like so much. Let’s start with the good: The Unica incorporates a ceramic grinder, built atop an 8.5-ounce bean hopper. The size of the hopper is well-matched with the size of the water tank we talked about earlier, and we regard that as a plus. What can happen with some models is that the designers pair a biggish water tank with a small bean hopper or vice versa. When that happens, you’re constantly having to stop what you’re doing to refill one, or the other, or both. It gets annoying quickly. When they’re well paired, you’ll find that they tend to run out at about the same time, which means you don’t see your coffee making flow getting interrupted as often. That’s what you get with this machine, so kudos to Gaggia! Now for the not so good: Minor point, but it’s a flat burr, rather than a conical burr grinder. We love the fact that it’s ceramic because it avoids the issue of overheating that stainless steel burrs have, but we prefer conical over flat. Not a deal breaker, just something we wanted to make a note of. The second issue though is a big deal. The grinder only has five grind settings. That’s lower than the industry average of six, and in our view, it’s not enough to allow you to dial into your flavor preferences. We’ve seen super autos with as many as 18 grind settings without dramatically raising the price, so we know it’s possible, and we were underwhelmed on this front. For new users, it should be fine, but you may find yourself outgrowing this machine more quickly than you had hoped. Pro Tip: This is not something that’s unique to the Unica, but is true of super automatics generally – they don’t do well with dark, oily beans, which can clog the grinder and shorten the life of your machine. For best results, find a medium roast you enjoy and stick with it. One final note before we leave this section: Sadly, the Unica does not come with a bypass doser, so there’s no way to use pre-ground coffee with the machine. We’re not sure why this was left off. It’s a common (almost universal) feature that would not have added to the cost of the machine. It’s almost certainly not a deal breaker for most people, but it’s worth drawing your attention to. 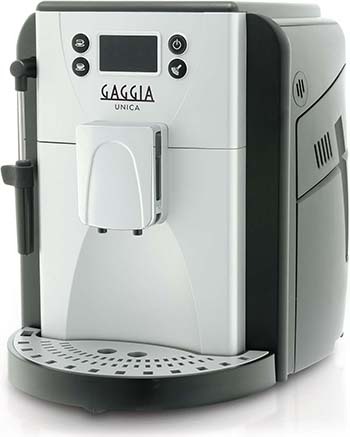 This is an entry-level machine, so it’s not at all surprising that the Gaggia Unica bean to cup coffee machine only features a single boiler. It’s an excellent one though, being aluminum, lined with stainless steel, and featuring Thermoblock technology. The key advantage of more expensive double boiler systems lies in the fact that you can simultaneously steam milk and brew a shot, which speeds up the drink making process. The Thermoblock technology helps minimize the wait time as the unit shifts gears from one task to the other though. In practice, you’ll find that it adds less than twenty seconds overall, which isn’t bad unless you’re a power drinker who’s constantly making milk-based drinks. If that’s you, then you’ll probably want to spend some more money and get a double boiler machine. Otherwise, this one will serve you well. This will be a relatively short section, but it’s worth noting and drawing your attention to the fact that the Unica does indeed have coffee spouts that move up and down. Even better, the range of motion is quite good, and this unit will accommodate cup sizes ranging from 2.5” to 6,” which means that you can probably even fit your favorite jumbo-sized mug under the spouts to dispense your favorite coffee creation into. This is a bigger deal than first meets the eye because the telescoping action of the spouts helps improve the quality of crema in your cup. For best results, adjust the spouts so that they’re sitting just above the lip of whatever size cup you’re using. 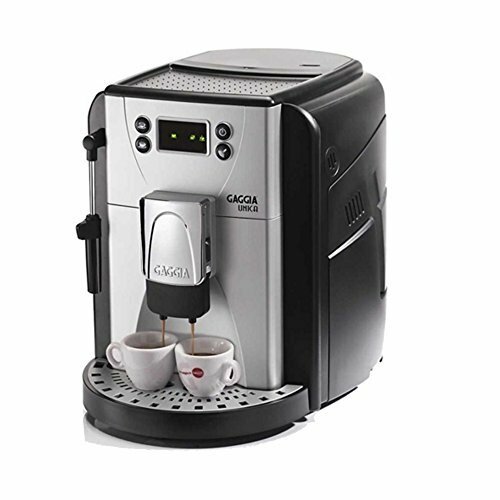 The Gaggia Unica espresso machine features a removable brew unit for easy cleaning. About once a week, you’ll want to pop it out and give it a thorough rinse. Let it dry, snap it back into position, and you’re done. The control system is about what you’d expect on an entry-level machine, and here, coffee purists will probably scoff at the little unit, because it doesn’t give you many options where fine-grained control is concerned. There are only four buttons, total on the device. One for a single shot, one for a double shot, the power button, and a button for steam/hot water. That’s it. The buttons are programmable, and you can adjust your shot strength and water volume, but there are no other aspects of programmability built in. Of significance, this means that you can’t set an auto-shutoff time, nor can you adjust the boiler temperature. You get what the machine gives you, and that’s that. This is not at all atypical of entry-level machines, and while that does offer you enough customization to get creative with your drink making, it also means that you won’t be able to pre-program advanced drinks and get them with the touch of a single button like you can with more advanced models. Even so, espresso lies at the heart of most specialty coffee drinks and armed with a machine that can make a good espresso and froth milk, you can create a stunning variety of drinks for yourself, your friends and your family. It’s got the basics covered, and honestly, that’s all we expect from machines offered at this price point. In that regard, it delivers, so we’re satisfied. If you’re new to the world of specialty coffee, then we need to pause for a moment to talk about the differences between drip brew coffee makers and machines like this. Skip this section if you’re not a newbie. You probably have a drip brew machine. You probably made coffee with it this morning, and may be enjoying a cup right now, as you’re reading this review. If you did, then you know that drip brew coffee makers rely on gravity to get the beans from the grounds chamber into your cup or pot. Espresso makers are different. They rely on pressure, and pressure is measured in bars, with one bar being equal to atmospheric pressure at sea level. It takes at least nine bars of pressure to make a great espresso, and the Unica’s pump is rated at fifteen bars, which means it has more than enough power to make world-class espresso, every time you use the machine. You may have read other Gaggia Unica espresso machine reviews that sang the praises of this particular feature, and ours will be no different. The company did an exceptional job here, and this is one of the strongest points in the design, in our view. There are essentially two ways to implement milk frothing on an espresso machine. Newbies tend to prefer the auto-frother because there’s no learning curve. You pour milk into a carafe, plug the carafe into the machine, push the button and go. The problem is, there’s not much nuance there. You get the froth the machine gives you. If you’re not satisfied with it though, there's nothing much you can do. The Unica doesn’t use that system. Instead, Gaggia opted for a proper steam wand. If you’re new to the world of specialty coffee drinks, this may be intimidating at first glance, but don’t be daunted by it! You can count on your first several milk-based drinks not turning out perfectly as you learn the dark arts of using the steam wand well, but once you master it, you’ll have an invaluable skill and can make real coffee magic happen, no matter where you are. The beauty of the frothing wand is that it gives you precise control over not just the quantity and quality of the foam you produce, but also over the temperature of the milk, and that’s absolutely fantastic. Gaggia rightly deserves high praise on this front! ​This is a more important feature than many newbies realize, and especially on machines with little to no means of controlling the temperature of the boiler. Specialty coffee drinks were meant to be enjoyed at temperatures somewhat lower than most Americans like their coffee, and because of this fact, one of the most persistent complaints with espresso makers across the board is that the coffee just doesn’t get hot enough. The problem is even worse where milk-based drinks are concerned because you can’t steam milk at the same temperature you brew coffee, or you’ll ruin its flavor. The net result is that milk-based drinks tend to be lower in temperature than straight shots of espresso. One of the biggest factors you can control on this front is the heat of your cup. If you dispense a drink into a cold cup, you’re going to lose several degrees of temperature. A pre-warmed cup mitigates this loss, and that is the function of the cup warming tray. If you’re not convinced, try a simple experiment. Brew two of your favorite coffee drinks. Dispense one into a cold cup, and one in a cup you’ve had sitting on the warming tray that the Unica has built onto its top. You will be amazed at the difference it makes! 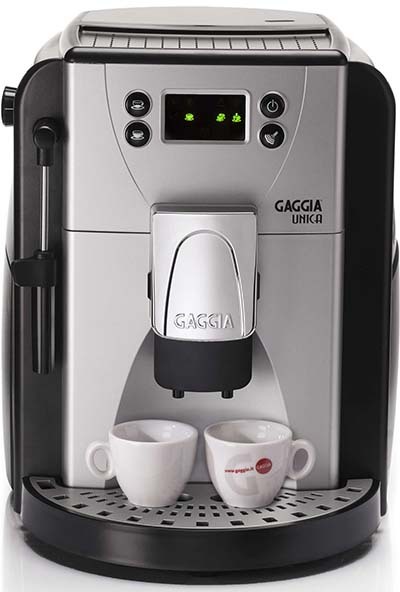 Like all the other machines the company makes, the Gaggia Unica coffee machine is incredibly easy to clean, and as a value-priced model with a limited feature set, it’s also very easy to use. That’s really all there is to it. If you perform those tasks religiously, this machine will serve you well for years after the warranty expires. Regarding use and mastery, there’s not a lot to it. With only four buttons, it’s probably less complicated than the drip brew machine you’re using now, so it’s likely that it will take you longer to set the machine up for first use than it will be to master its function. Considering that this is an entry-level model aimed at newbies, there’s a lot to like about the Gaggia Unica coffee machine. While it’s true that it lacks advanced functionality and one-touch convenience, it’s got the basics covered, and will give you everything you need to make all your favorite coffee shop drinks from the comfort of your home. None of those are crippling weaknesses, although a more experienced home Barista will probably chafe under the limitations imposed by this model. 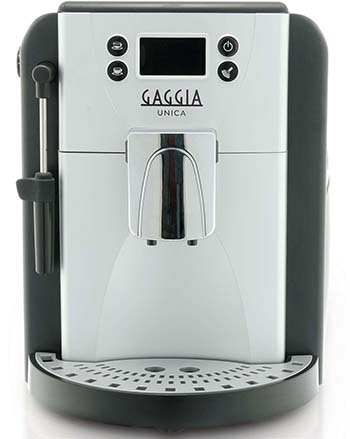 And that wraps up our Gaggia Unica coffee machine review. If you’re a newbie, looking for your first machine to introduce you to the world of specialty coffee drinks, and you don’t want to spend a fortune on it, this is a solid bet. It gets the job done in a simple, affordable package. The only potential downside is that you may outgrow it sooner than you thought you would. If you’re a more experienced specialty coffee aficionado, this machine probably isn’t for you. It’s too limited, and you’ll find yourself annoyed by it. On that basis, we recommend it for newbies, but do not recommend it for experienced users or coffee purists. 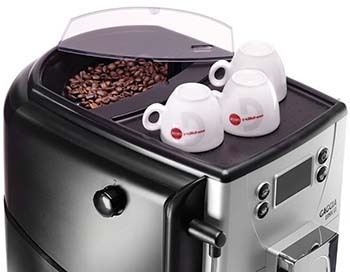 We also don’t recommend it for large households with multiple coffee drinkers, because the tank and bean hopper capacity will struggle to keep pace with your demands. 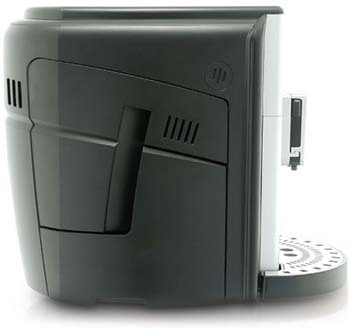 Gaggia Milano. Official Brand Website. How To Unclog An Espresso Machine. My Espresso Machine. Thermoblock vs Heat Exchanger. Coffee Revolution. 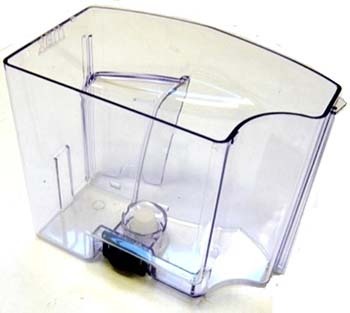 The Importance of Using Filtered Water in Your Coffee Machine. Crema Coffee Garage.